Ahh butterflies! 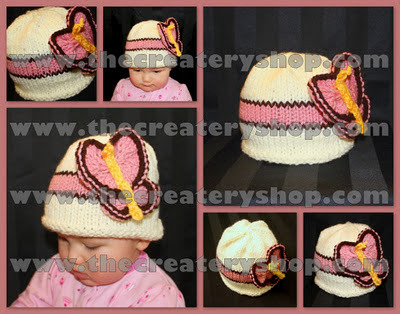 When I thought about knitting a baby butterfly hat I had this image of a big butterfly landing on my baby's head while she was playing. Of course, the butterfly had to be a big and beautiful one! As you can tell from the title, I am trying to fit in as many B words as I can! Enjoy! - Knitted hat brim measures approximately when completed (14 inches, 18 inches, 22 inches) in circumference.